Over the years, we’ve been proud to lead our industry in many areas. For example, in 1992 we were among the first restaurants in the country to ban smoking. The state of Washington made it official in 2005. 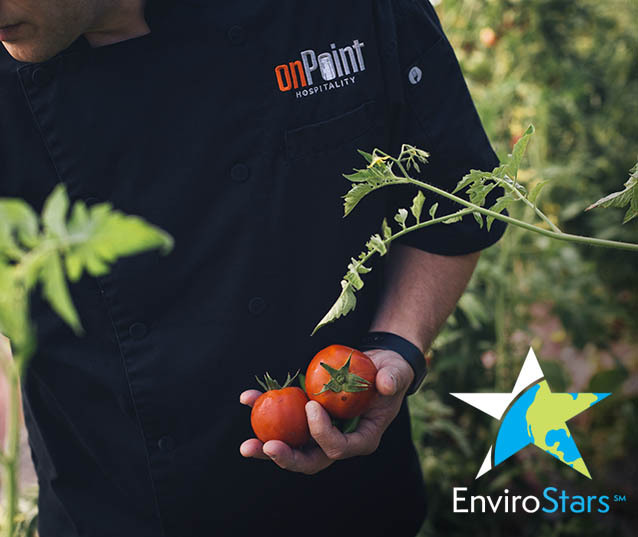 We were recently nominated by the City of Kirkland to go through the EnviroStar accreditation process. We were vetted by this consortium of public works agencies and just heard the great news that we are, indeed, still a leader, change agent and, now, officially, an “EnviroStar”. Choosing recycled-content paper and reducing the amount that we print (we are currently working on technology that will allow us to avoid printing your bill at the end of the meal—while this sounds small, it’s a huge deal actually). Switching to compostable straws and togo packaging. Changing out equipment regularly to reduce our carbon footprint. For example, low energy, water saving dishwashers (huge drivers of waste in our industry). Moving to hot water on demand vs. Holding and heating huge tanks of water. It’s important to us to help keep Washington’s water and air clean, and to run our business in a way that protects the environment we all share. Running our business sustainably keeps our employees safe (and happy!) 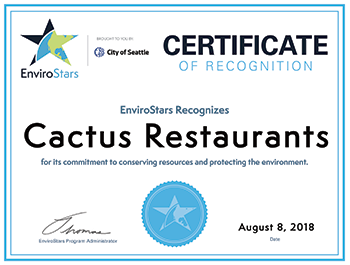 and helps the environment—its just the right thing to do, yet we are still proud to receive this recognition.